The last time you were in the emergency room after a horrible accident involving a PVC pressure vessel, a nurse probably clipped a device called a pulse oximeter onto one of your remaining fingers. These small electronic devices detect both your pulse and blood oxygen level with a pair of LEDs and a photosensor. [Anders] sent in a great tutorial for building your own pulse oximeter using a fancy ARM dev board, but the theory behind the operation of this device can be transferred to just about any microcontroller platform. The theory behind a pulse oximeter relies on the fact that hemoglobin absorbs red and infrared light differently based on its oxygenation levels. By shining a red and IR LED through a finger onto a photoresistor, it’s possible to determine a person’s blood oxygen level with just a tiny bit of math. Of course a little bit of hardware needs to be thrown into the project; for this, [Anders] used an EMF32 Gecko starter kit, a great looking ARM dev board. After connecting the LEDs to a few transistors and opamps, [Anders] connected his sensor circuit to the ADC on the Gecko board. From here it was very easy to calculate his blood oxygen level and even display his pulse rate to a PC application. Yes, for just the price of a dev board and a few LEDs, it’s possible to build your own medical device at a price far below what a commercial pulseox meter would cost. FDA approval not included. The next time you’re unfortunate enough to make your way to a hospital, emergency room, or urgent care clinic, you’ll be asked to attach a small pulse monitor to your finger. The device the nurses clip on to one of your remaining digits is called a photoplethysmographic sensor, and basically it is able to read your pulse through reflected light. 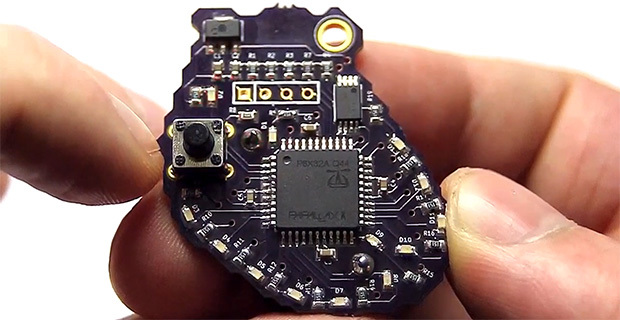 In the search to find out how these devices actually work, [Raj] sent in a great tutorial covering the theory behind photoplethysmographicy, and also built a simple device to detect a pulse without using a microcontroller. These photoplethysmographic sensors operate by shining light into someone’s flesh – usually a finger or ear lobe – and recording the light reflected back to the source. 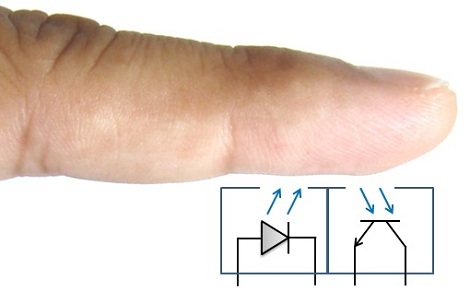 The volume of blood in the finger will have an effect on the amount of light reflected back, and makes for a perfect way to automatically measure someone’s heart rate. To build his device, [Raj] used a TCRT1000 reflective optical sensor. Inside this sensor is an infrared LED and a phototransistor. Of course with a finger over the sensor there is a ton of noise both from ambient light and the base rate of reflected light from a piece of flesh. 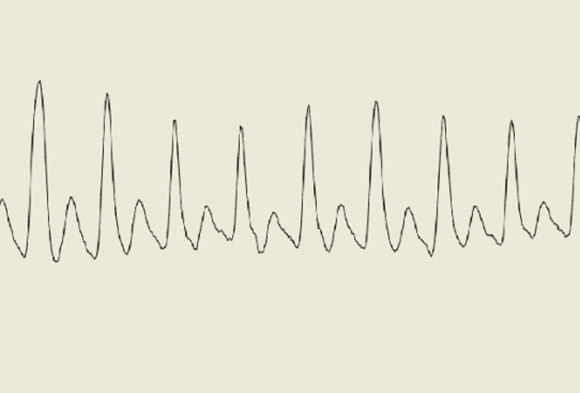 [Raj] filtered this out, leaving only the small variations in the amount of reflected light, thus creating a very simple – and very inexpensive – electronic pulse meter. After seeing some heart rate monitor apps for Android which use the camera and flashlight features of the phones, [Tyson] took on the challenge of coding this for himself. But he’s not using a smart phone, instead he grabbed a headlamp and webcam for his heat rate monitor. To start out he recorded a test video with his smart phone to see what it looks like to cover both the flash LED and camera module with his thumb. The picture is mainly pink, but there’s quite obviously a color gradient that pulses with each gush of blood through his skin. The next task was to write some filtering software that could make use of this type of image coming from a webcam. He used C# to write a GUI which shows the live feed, as well as a scrolling graph of the processed data. He took several tries at it, we’ve embedded one of the earlier efforts after the break. [Shane Burrell] decided to spend some time learning how the keypad on the his Kenwood TM-710A APRS radio mic works. It uses a different technique than you might think. Normally a grid of buttons is scanned as a matrix to detect keypresses, but this hardware actually counts pulses on a serial wire to take each reading. The stock radio sends a steady digital pulse to the handset and with each pulse the mic pulls the line low. It then uses a 4017 decade counter to see what comes back. If the edge count matches it means nothing is pressed, but a change in the number of pulses returning to the base unit can be used to extrapolate which button has been pressed. [Shane] went on to implement this control technique using an AVR chip in place of the radio base unit. 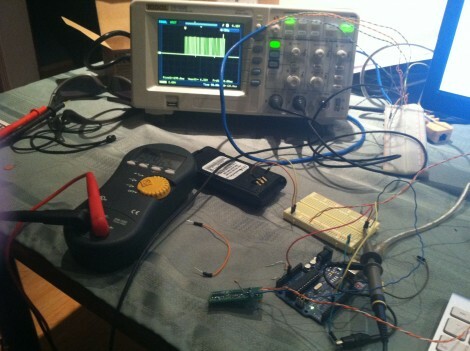 He used the data gained from measuring the pulse behavior using an oscilloscope to write the firmware for the project. He filmed a bit of a demo after the break which shows his findings. We’re not quite sure how this would translate into your own home-brew projects, but the thought of scanning a keypad with two pins of a uC is quite desirable. Sure there is the 555-timer frequency technique, but we’re always down with new ideas. 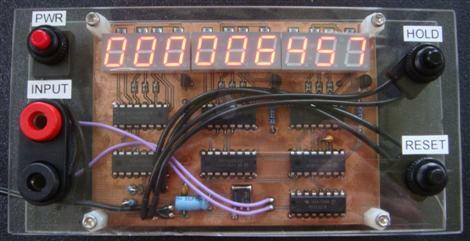 At roughly $20 to build, this 9 digit pulse counter is an excellent example of home built tools. The builder, [Josh] found himself repairing a device and in need of a pulse counter. With the components cheaply available, he just built his own. 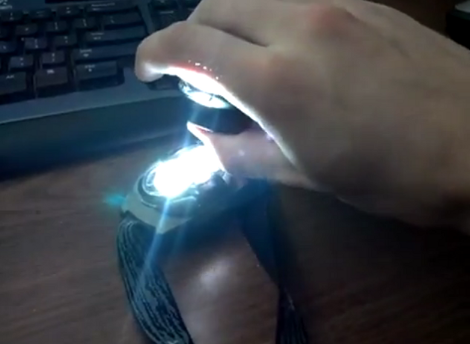 He says that it has a few limitations, like display brightness, but overall it seems to do the job well. You can download the PCB from his site.